On the first day of class every year, Harvard professor Michael Puett makes this promise to his students: “If you take the ideas in these texts seriously, they will change your life.” Judging from the course’s popularity, students agree. The class is “Classical Chinese Ethical and Political Theory” and it is now the third most popular at Harvard – only after intro to economics and intro to computer science. 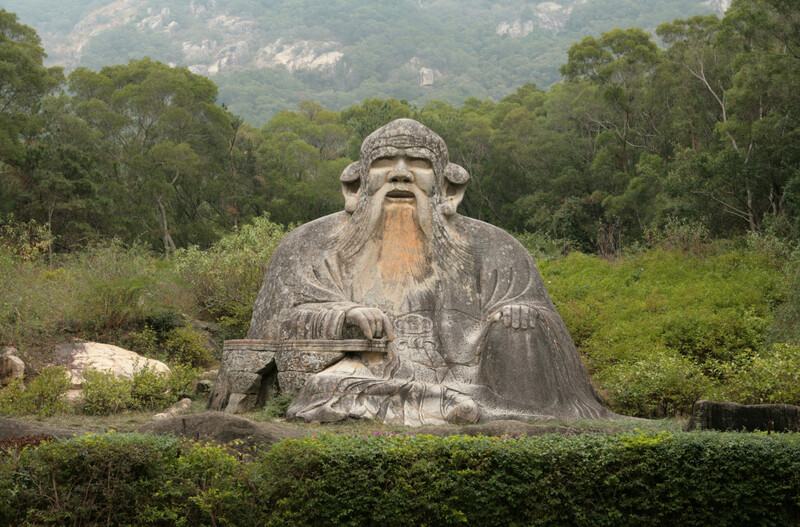 The course offers counter-intuitive ideas on how to live a better life, based on the thinking of Chinese philosophers who lived thousands of years ago. Now Michael Puett and East Asian history scholar Christine Gross-Loh have turned the teachings into a book called ““The Path: What Chinese Philosophers Can Teach Us About The Good Life”. They join Diane to talk about why these ideas are resonating, particularly with young people today. MS. DIANE REHMThanks for joining us. I'm Diane Rehm. Harvard professor, Michael Puett first offered his introductory course on classical Chinese ethical and political theory in 2006. He thought a couple of dozen students would enroll. But by the following year, hundreds had and today, it's the third most popular course at Harvard. So why are the teachings of Chinese scholars who lived thousands of years ago resonating with young people today? MS. DIANE REHMHere to talk about these teachings, Michael Puett and Christine Gross-Loh. They're the authors of the new book titled, "The Path: What Chinese Philosophers Can Teach Us About The Good Life." I'm sure you'll want to join us. Give us a call, 800-433-8850. Send an email to drshow@wamu.org. Follow us on Facebook or Twitter. It's so good to meet you both. MS. CHRISTINE GROSS-LOHIt's wonderful to meet you. Thanks for having us. MR. MICHAEL PUETTThank you so much. Wonderful to meet you. REHMWell, we're delighted to have you here. Michael Puett, you are a professor of Chinese history. What is it, in your mind, that makes your class so popular today? PUETTI think these ideas really offer a fundamental challenge to a lot of our assumptions about how to live a good life, how to be a good person and I think for students, these ideas really resonate now and it's opening them up to a lot of possibilities that often they hadn't imagined before. PUETTI think a lot of them grew up being told a very comparable mantra, a mantra that you should always be looking within trying to find yourself, trying to be sincere and authentic to yourself. They've heard things like this and I think they're beginning to realize that perhaps these ideas, as great as they sound, ironically, kind of constrain one and restrain what one can do. And they're really being excited by ideas that offer a very fundamentally different way of thinking. REHMA different way of thinking. Describe, if you can, in a paragraph that different way of thinking. PUETTSure. So they will say maybe instead of having one true authentic self, maybe we're just kind of messy creatures, messy creatures with lots of different emotions and desires and faculties. And what we tend to do as humans is fall into kind of patterns and ruts in our ways of responding to people. And so if you look within and try to find that true self, maybe what you're really finding is just a bunch of these patterns and ruts you've fallen into. PUETTAnd if that's true, these philosophers would say, well, the goal is to not be authentic to those ruts. It's to break them and to do things like rituals that break you out of these patterns and develop a better way of being in the world. REHMAnd Christine, at least up to now, so many people, young people on up through adulthood, have turned to psychiatry, have turned to the medical model to help straighten out that thinking. How did you become involved in this whole idea? GROSS-LOHWell, it's interesting. I actually did a doctorate at Harvard University when I was, you know, years ago and I had taught Chinese philosophy to undergraduates. I am (word?) American so I was raised understanding what I thought was Asian philosophy and when I went to Michael's class for the first time and saw what he was teaching and how he was teaching and the ideas that he was teaching, I realized that there was a very fresh way of looking at these idea that espoused a more active way of being in the world, which really goes against, I think, a lot of our stereotypes of what Asian philosophy or Asian ways of being in the world are like. REHMWhat do you mean, a more active way of being in the world? GROSS-LOHWell, what Michael was talking about with the whole idea of the self, for instance, I think in the West, there tends to be this idea that the self is this -- there's this grand individual self and a lot of our energy is focused on cultivating this grand individual self, which has agency in the world. But exactly as we talk about in our book, if you're busy being authentic to that self that you think that you have discovered and that you are cultivating and that you are promoting, you actually end up constraining yourself. GROSS-LOHAnd these philosophies, they are very disparate. There are a lot of different, you know, messages in them, but the overall message that I got from them was that they're actually -- although they look passive, they're much more active. They have resulted in much more growth, transformation, but also agency not just in becoming a better person, but creating a better world. REHMWhen you say the old ideas, constraint, what do you mean by that? Constrained in terms of how you think about what your options are? GROSS-LOHYeah, definitely, absolutely. First, they're constraining in terms of thinking about who you are, like this is me, you know. I'm this kind of a person. I've taken the Meyers-Briggs test. I know that I am, like, an introvert. I'm, you know, we all love throwing around these labels. And I love it, too. It's fun, but if you take it too much at face value, you really are labeling yourself into a little box. REHMSo what happened to you after you took Michael's course? GROSS-LOHYou know, I didn't -- actually, I didn't take the course. I sat in on it because I was writing an article about it, but I thought that his take on every philosopher that I thought I had known was extremely fresh. And one thing that he does in his course, which I think is very important, is he asks the students to read the text alone, just the primary sources, not secondary sources, because there is a whole history that -- of why we misunderstand what philosophies and ideas from other parts of the world are. REHMGive me an example, Michael. PUETTAbsolutely. So most people will tend to assume that Chinese philosophy is really about simply being trained to accept the world as it is. So accept your social position, accept that the world is simply a harmonious world that we should accord with. Most secondary literature presents it that way. It corresponds to our stereotypes of so-called traditional societies. And so as Christine said, in the course, we say read no secondary literature. Simply read the text themselves. PUETTThey quickly see that the texts are actually arguing something very, very different and something they find extremely powerful. REHMGive me a sense of the difference between the original, say, text of Confucius and a secondary text. PUETTYes. So with Confucius, often people will say, oh, Confucius is simply teaching us to do a bunch of rituals and those rituals will teach us how to be a good father or a good son or a good wife and teach us how to properly play our roles. Then, you actually look at these texts and in terms of ritual, their whole point is no, no, no, ritual is to break us from these standard things we're doing in our lives. PUETTYes. So the argument is, we tend to fall into these patterns and responses. And when you enter a ritual, you, for that brief moment, become a different person. You act as if you are a different person relating to those around you in a different way. REHMGive me an example of breaking a ritual, as far as fatherhood is concerned. PUETTYes. So one of the ones they will talk about is imagine a father/son relationship, which sometimes can be very troubled. I'm happy to say mine certainly was never troubled at all, but sometimes they can be. So in this ritual, the father and the son would have to enter a ritual space and do a role reversal so each would have to play the role of the other and the idea is it forces each to see the world from the other's perspective. REHMAnd is that what you're doing in your class? PUETTYes. So what I will do is say, think about even little customs and conventions we do throughout the day and if you think of these as rituals, what you're doing is you're really trying to, for that brief moment, become a different type of person and develop different emotional responses to those around you. And it's those little breaks throughout the day that really can transform how we live in the world. REHMI'm baffled by how you have a basic text and a secondary text and how they seem to leave one to such different conclusions, Christine. GROSS-LOHWell, I think that a lot of it has to do with our sort of reverence for authenticity. This word is bandied about a lot and we all think it's important to be authentic. If you're looking at the world through the eyes of authenticity, then you're either going to look at these rituals as -- you're gonna look at them as literally socializing people into what to do and then you look at the rituals of a traditional, an older, you know, the older texts of a culture such as China and you think that this was a culture in which these rituals were a way to socially sort of control the population. REHMAs-if, that's very important in your book. GROSS-LOHSo as-if is -- it is. The term as-if is really like, you know, we think of rituals, actually, as -- we might think of them as ceremonies or something a little formulaic. But an as-if ritual in the Confucian sense is really a sort of ritual in which you do something and you behave as if you are something else. And so one modern example might be a game of hide and seek with a child. An adult plays hide and seek with a child. The adult hides, but doesn't hide too well. GROSS-LOHThe child, you know, is looking all over, a 3-year-old kid, you know, has no power in his life, but he finds the adult and he's gleeful because he's overpowered the adult and the adult has played the role of a befuddled, you know, person bested by a child. They have engaged in a role reversal somewhat comparable to what -- a Confucian ancestor worship ritual in a way. It's a role reversal. And it hones different parts of each of them. And you think, okay, so they do that and they go back to real life, but no. Every time you do this, you come back slightly changed. REHMChristine Gross-Loh and Michael Puett, the co-authors of a new book. It's titled "The Path." And we'll be taking your calls, your comments after a short break. Stay with us. REHMAnd welcome back. We're talking to a professor at Harvard University, professor of Chinese History, who teaches a course on what Chinese philosophers can teach us about the good life. He's written, with Christine Gross-Loh -- who audited his course, I gather, and then wrote about his course. The book is titled, "The Path: What Chinese Philosophers Can Teach Us About The Good Life." Here's an email from Adam, who says, what is it about Chinese philosophers, in particular, that resonates with people? What sets them apart from, say, Greek and Roman philosophers? Michael. PUETTIt's a wonderful question. And one of the things that's so intriguing when you read Chinese philosophy is you realize some variations of these ideas do in fact appear in Greece and Rome as well. And we think of these as radically different ideas, but actually versions of them appear elsewhere too. And what's particularly intriguing about the Chinese tradition is a lot of these ideas about how to use rituals and how to do these practices to develop the self became such a focus of philosophical interest over the course of, say, 2,000 years. And so, in a sense, what you're getting is an incredibly developed, refined version of things you also see elsewhere, but sometimes that became less significant over the later tradition. REHMAnd what was it, in your own background, that drew you toward the Chinese philosophers? PUETTVery much along the lines of this question. So I, in high school, began reading texts from around the world simply to see what different cultures thought about things. And I found that the Chinese material was incredibly powerful, dealing with issues that, again, one sees elsewhere, but really developing them in ways that I found very, very exciting. Often in ways that I couldn't then understand but that I decided I should really devote a lot of my life trying to understand. REHMAnd do you think you are on a path to understanding? PUETTI would think of the path I'm on very much the way that these philosophers will talk about the path or the way, that was the Chinese term. Which is to say, it's ever changing and you're not on a clear path, you're sort of working with things endlessly. And in terms of these texts, I think it's a life-long process of trying to understand these texts, teach these texts. I learn new things about them every time I read them. PUETT...as I just live my daily life. REHM...are told that they need to define their path early on. REHMIf young people were exposed to this kind of teaching at an earlier age, would it, do you think, confuse or would it help them to better clarify who they are and how they want to go forward? GROSS-LOHWell, I think one of the most interesting things about these ideas for young people is that so often, especially these days, they're told to define that path to their future exactly as you say. And then they -- so they feel stressed thinking, well, who am I and how am I going to fit things into -- how am I going to fit myself into this future that I think I need to be heading toward? Instead, the idea is, you can't -- if you're making plans, concrete plans for a self that you think you're going to be in the future, you're actually making very abstract plans. GROSS-LOHBecause those are being made for a future self that you can't have any idea who you're going to be, because you're constantly shifting, the world is constantly shifting, your circumstances are constantly shifting. So Chinese philosophy offers a very mundane, very, very doable way of growing through the small things that you do every day that actually end up leading to great change. There is a saying, you know, you have to move slow to move fast. And I think that that sort of perfectly exemplifies, when you're sort of racing toward an end goal and trying to fit everything into that, you're going to miss out on some of the things that would actually lead you in directions that are really going to feel good for you. REHMSo the Chinese philosophers say, go slowly and look at each happening within that moment. PUETTVery much so. So they will argue, a lot of who we think we are really comes out of the little ways that we react to people throughout the day, ways we're behaving that, again, fall into these patters and ruts. PUETTSo, yes. A typical one, people will say, well, I'm just the sort of person who gets angry at little things. But I'm also the sort of person who's good at thinking big. Well, maybe those are just patterns we've fallen into and a way of begin changing is precisely there. So why do these little things make us angry? And what are the little things that lead us to get angry at these tiny little events? And you slowly begin to realize those are fully changeable patterns. And that opens up possibilities that you truly could not imagine now. REHMBut real disappointments do occur in day-to-day life. PUETTAnd they will strongly emphasize this too. It's a capricious world. Things happen that we can't preplan -- sometimes great things, but sometimes horrible things. And so, for them, a lot of the key is how we respond to the world, how we respond to these ever-changing events around us. And if we respond well, we can still lead a wonderful life. If we don't and stick to our same patterns, then we're just dependent on what happens to occur to us. REHMSo give me an example of a good response. PUETTSo a good response would be a response in which you're always trying to work through the deeper complexity of an issue. So, for example, concretely, someone says something that makes me angry. Well, maybe I did something that drew out that anger are the things I could do that could begin to alter that relationship. If so, I'm not only altering that relationship, I'm probably altering ways I'm acting in the world in a more general way. And if you take that and develop it, then even big things, you know, a huge, horrible event, slowly we're training ourselves to respond better. Because we're seeing the complexity, we're seeing the underlying possibilities that may be emerging. PUETTAnd slowly you're training yourself to respond well in that sense of working with issues, developing situations, and ultimately altering them and ourselves and those around us for the better. REHM...to write about it, what did you observe about the students in that class? How were they reacting? GROSS-LOHI was actually surprised because I -- when I first heard about the course and went in, I, first of all, I thought that it might be mostly Asian-American students. This wasn't the case at all. And then I thought, you know, these students, you know, I just didn't really know what to expect. It was an incredible mix. They clap after every lecture, which I think is very unusual at Harvard. They -- he has a lot of students who come to him during office hours. He's extremely accessible to them, very open and warm. And I have heard more than one student tell me, he embodies his teachings. He embodies what he teaches. GROSS-LOHAnd so I think that seeing someone who is taking Chinese ideas so seriously and really opening himself up to how they can change you, as a person, is really inspiring. It's interesting, because there's this idea about being authentic and being real. And in a way, you could look at these ideas and say, well, they're actually sort of telling us to fake it in a lot of situations. But the precise idea is, yes, your behavior can lead you rather than the other way around. You don't have to be the one -- you don't have to act on your real, authentic feelings, despite how destructive or hurtful they might be, just because you want to be true to yourself. GROSS-LOHAnd I think that's a message that this generation in particular responds to. Because it's a message that aims for a world of connections, where people are better to one another. That's certainly not all the course is about whatsoever. And there's a whole second half to the course that's about political theory. But they're both linked because they're about making a better self to make a better world. REHMIndeed. And what about the confrontation with a young person who has been told since infancy, you are absolutely wonderful. You're -- and trying to ensure that that child's self-esteem is enormous. So then they get to a class that you're teaching, Michael, on Chinese philosophy, and they begin to maybe question that a little bit. Is that what you want them to do? PUETTIt certainly is one of the things I'm hoping for. As you said, these are students who often have been raised with the self-acceptance mantra, oh, embrace yourself, love yourself for who you really are and always be true to who you are. Including the bad sides of yourself, but the good sides too and just love yourself for who you are. And for a lot of the students, I have found, growing up this way, it's a mantra that sounds great but makes them very unable to really deal with a lot of the complexities of the world. It restrains them to this idea of who they really are. PUETTAnd they find it liberating in the long run to be told, oh, actually, no, that's actually a very dangerous way of thinking. Think of yourself instead, again, as a messy bunch of things that can be changed and altered and transformed. REHMAnd have you seen them change before your eyes? PUETTVery much so. One of the single, most wonderful things for a teacher is actually having students who respond to these texts. And they really do. They do in the very early sense and then, years later, I get emails from them saying that they've really begun to alter who they are and changed their lives instead of this assumption that they should just be who they really think they are. REHMOf course what's so interesting here is that most of these young people -- perhaps I'm generalizing too much -- but most of them are sort of focused on the new technology, the newest thing in the world and how can I acquire it? What can I make of it? And you're somehow telling them to go back. PUETTYeah. We tend to assume that we can't really learn much from the past and certainly not from so-called traditional societies. And students find, when they read these texts, that actually a lot of their assumptions about certainly the past and about traditional societies in general have really been wrong. And they find that, yes, these texts really do speak to very basic ways that they're living their lives. PUETTVery much so, in a particularly strong sense because, again, we've gotten so taken with our mantra of self acceptance and being true to oneself. I think that's in part why students find these ideas so powerful because it's a very counterintuitive way of thinking and yet a very dramatically empowering vision of how to live. REHMAnd yet what happens when bad things happen? PUETTWell, I actually think taking some of these ideas seriously helps them in that. It helps them get ready for the fact that, again, it's a capricious world. Things will happen, including horrible things. PUETTIt is not a fair world. And horrible things happen. And if you're thinking more of, how do I respond to situations and grow from them, rather than, oh, things will be okay as long as I embrace who I really am. It gives them much more powers and resources to really deal with the world and all of its complexities. REHMAnd you're listening to "The Diane Rehm Show." If you've just joined us, Michael Puett, professor of Chinese History at Harvard University, and Christine Gross-Loh. They are co-authors of a new book titled, "The Path: What Chinese Philosophers Can Teach Us About The Good Life." Let's define the good life. PUETTYes. So we tend to think the good life is one where I'm being true to myself and authentic and sincere to myself and therefore living my life on my terms according to what's best for me. A lot of these philosophers would say, no, no, no. Think of the good life as a world that we help to create, in which we and those around us can flourish, in both an immediate sense -- immediate friends and families -- and in a larger, global sense. And they would say, that's the focus. It's not about me. It's about creating worlds in which we can all flourish. REHMInteresting. All right. We've got lots of callers. Let's open the phones, 800-433-8850. First, to John in Bristol, Va. You're on the air. JOHNHello. Can you hear me? REHMSure can. Go right ahead, sir. JOHNGreat. Thanks. So I'm kind of involved in this whole idea of changing behavior. I love the conversation around changing patterns by just doing something a little bit different each day or, as you approach a situation where it's been a negative pattern in the past. And, you know, there's a lot of people that have written about that, even in Western cultures. But how do you see that applied in a corporate environment where, you know, a lot of corporate cultures are very negative and they need to be shifted to where they can have a stronger, more interesting culture that embraces diversity, not just tolerates diversity, but actually embraces diversity of thought and helps to keep -- so we know that organizations that do that thrive? PUETTThank you, John. That's an absolutely wonderful question. And I agree completely with what you're getting at here. Often we think, well, what really matters in a corporation is simply getting talented people there and telling them to work hard. And if they're things like discrimination, we just need procedures and laws saying, don't discriminate, and that will solve the problem. I think you're completely right, that actually that solves -- I mean, it's important to have those, but that really doesn't solve the problem. PUETTThe problems really come down to the daily stuff. It's how people interact. It's how the culture operates. It's the atmosphere. It's how meetings are run. It's how an office is arranged. And if you really listen to these ideas, you end up focusing on things like that. How are meetings arranged? How do people talk? When people raise ideas, is there encouragement in the atmosphere or not? And, if not, and usually the answer is no, how do you alter that? And it comes down to very basic things sometimes, of really working with people in terms of how they interact, tones of voice they use, body language. PUETTAnd in terms of issues like diversity, that oftentimes is one of the keys. We're trying to create a more diverse world precisely by creating an atmosphere within which everyone can flourish. And it's the little things, the seemingly mundane things that you really can make the difference in. REHMMichael Puett and Christine Gross-Loh, co-authors of a new book titled, "The Path." We'll take a short break here. And when we come back, more of your calls, your email. I look forward to hearing from you. REHMAnd we're back with Michael Puett and Christine Gross-Loh. Michael Puett is professor of Chinese history at Harvard University. He and Christine Gross-Loh have written together a book titled "The Path: What Chinese Philosophers Can Teach Us About The Good Life." Let's go to Tallahassee, Florida. Julia, you're on the air. JULIAHi, Diane, I was just listening to your show. I'm a social worker and a counselor, and I just want to say I love that you're teaching students these really great skills because this is basic cognitive behavioral therapy, where you can't really change situations or control what's outside of you, all you can change is your perspective and how you handle situations. And I really want to say that I loved what you said about choosing to grow from challenges because it's not something that happens naturally. It's something you have to choose to do. REHMWell, as one who spent several years in cognitive behavioral therapy, I must say I agree with you totally. Michael. PUETTThank you so much, Julia, it's a wonderful point, and I, too, fully agree that part of the key is precisely to alter basic ways we act in the world. And you do that not by looking within and trying to find your true self, you do that by actually, literally altering your behavior. And as you said and put it so eloquently, it's really about training ourselves in terms of how we're responding to the world, why we fall into these dangerous ruts, how we can alter that. And that's the basis by which we can actually live a great life regardless of the sorts of things that will inevitably happen to us. PUETTIt's about how we are actually living and responding to the world. So a beautiful question, thank you. REHMHere's an email from Washington, D.C. How do you respond to envy or jealousy from someone else, even if it has nothing to do with something you did wrong but probably something you're doing right? What do you think about that, Christine? GROSS-LOHWell, what I love about these texts, and there's one -- there's a Confucius text called "Nature That Emerges from the Tikri," (sp?) and it's all -- the insight into human nature is amazing. And it really is about how human beings, what we are is just messy, complicated people bumping up against messy, complicated people all day long. And we are drawing out different responses from other people. So I would say yes, envy is one of the most common human emotions that there is. It comes out very often. And often what we are doing is drawing a response from other people. Even if we are doing something right, we can -- we can think in terms of what can I do, then, to draw out another side of that person because that person is a complicated person with many different sides, and there's some behavior I can change in myself to pull out another side, maybe a more cooperative side. GROSS-LOHThink about it. Maybe the person was feeling a little bit ignored or slighted in some way that you inadvertently, you know, that you didn't realize. GROSS-LOHThat elicits a different side, and it happens. It can happen. I actually -- I find this personally a very helpful tenet all the time to think, okay, that person's having a bad response to me, what can I do to elicit a different side of that person. REHMBecause there is nothing you can change about that person, but you can change yourself. GROSS-LOHWell, by changing yourself you can pull out a different side. The person is as complicated as being as you are, with many different responses all throughout the day. REHMHere's an email from Laurel, who says, so far your guest is only talking about Confucian ideas. What about Taoism? Taoism was, in many ways, the opposite of Confucianism and more helpful in my opinion. PUETTThank you so much, Laurel, it's a wonderful question. And let me actually answer by means of an example. So one of the great Taoist philosophers is a figure called Zhang Jue, who as you said will criticize Confucius, but it's a very intriguing criticism. What Zhang Jue will argue is yes, Confucius is right that we need to break these patterns and ruts we fall into. We need to use things like what Confucius will call rituals to force us to see the world from different perspectives. We mentioned the father-son example before. But Zhang Jue will say that's not going nearly far enough because that's still residing within the human realm. PUETTAnd Zhang Jue will say, well, we need to break from that perspective, too. We actually need to actively try to see the world from the point of view of a butterfly, a bird, a worm, and all perspectives give a very different vision of what's going on in the world, and even restricting ourselves to the human is, in the long run, potentially going to lead us down dangerous paths and a dangerous pattern. So Zhang Jue will say dramatically expand this notion and constantly train yourself to be seeing the world from numerous perspectives, including even non-human ones. It's a wonderful question, thank you. REHMAll right, and let's go to Jess in Bradenton, Florida. You're on the air. Are you there? Let's try -- let's try it again. Jess, are you there? JESSAll right, thank you. My question is for Michael. I've read several translations of the Tao Te Ching, and I was wondering which one is your favorite and what your favorite passage from it is. PUETTWell, thank you, Jess. Wonderful question. There are indeed many, many translations out there, and they give you very different readings from the text. The translations are surprisingly different. I would say one of my favorites is actually a rather old one. It's one done by Wing-Tsit Chan. It's spelled W-I-N-G-T-S-I-T, and the last name is C-H-A-N. And it's in part just because I think he's very good about giving you the kind of ambiguity in the Chinese and therefore allowing you to work with the text kind of like you would do when you're working with the original because it's a very, very difficult, complicated text. PUETTAnd in terms of my favorite passage, I'm embarrassed to say I am going to give the easy one, which is the opening lines, which is usually translated, the way that can be spoken of is not the enduring way. If you do it literally, though, it's, the way that can be wayed, in other words made into a self-conscious, defined path, that is not the enduring way, and the point of it of course is to say when we pre-plan for ourselves and define our perfect path, we're missing it. The real way is the world in its ever-changing complexity, and that's what we should be training ourselves to work with. It's a great question. REHMAnd here's an email from Jeff, who says my concern is that the new China, which has grown out of the Chinese brand of communism as well as the new Chinese capitalism, don't seem to reconcile with these foundational and progressive ideologies of the China of old. PUETTThank you, Jeff, wonderful question. I do very much agree. So we've gone through about a century now when China first, as you said through communism and then much more recently through a kind of extreme form of neo-liberal capitalism, has been actively rejecting its past. Now the intriguing thing is right now, by which I mean literally in the past six, seven, eight years, this is beginning to change. And there's a self-conscious debate developing in China of people saying have we lost our values, do we need to recover some of these ideas, and China has an incredibly active blogosphere where suddenly all of these ideas, these texts are being actively debated. And so suddenly they're back in the public discourse. REHMAnd how does the leadership feel about that? PUETTWell, for a long time they kind of ignored it and before that of course tried to actively stamp it out. Now they're beginning to embrace it. And so now they, too, are becoming involved. And how that will play out, of course, is anyone's guess, but it's a very intriguing moment in Chinese history where suddenly all of these ideas are alive at both the popular level and the governmental level. REHMAll right, let's go to Frank in Sperryville, Virginia. You're on the air. FRANKYeah, thank you. I live right next to the entrance of a national park in Virginia, and the last couple of years particularly, I've noticed the crowds, the visitors to the park, have, like, just quadrupled. And I wonder if part of the interest, the recent interest, in Chinese philosophy is partly related to -- because particularly Taoism and stuff is nature-oriented, and people are so overwhelmed with technology and the emphasis on information and facts that people are intuitively attracted to the nature part of it. And I wonder if you could comment on that. PUETTAbsolutely, wonderful question. And I think you're exactly right. I think part of what works about this ideas, when they emphasize these points that we fall into patterns, we fall into ruts, and we need constant breaks from these to open ourselves up, I think they're profoundly right, and your example is a perfect one. Oftentimes we will intentionally go to things like parks to break from our usual way of being, open up a different perspective, and of course they key they will emphasize strongly is to say if we simply go in this example to the park but then return to our everyday life, and it's simply a break in the sense of calming ourselves down. PUETTBut then we return to life as usual. It's not really working. The way to really do it, of course, is to, to stick with the example, go to that park and really develop these different dispositions and then when one returns to one's everyday life, alter that everyday life accordingly. In other words, one treats it kind of like what they would call a ritual. REHMSo what you're saying, if you're using that going to the park as an example, what you seem to be saying is you've got to consciously think about how to change whatever is going on in your head to almost reject that familiar idea that keeps coming in there, recognize it's there but then say I'm going elsewhere. PUETTPrecisely. So yeah, if we simply go to the park, feel good for a brief moment, we'll often do this on a weekend, and return to our lives unchanged, it's in a way actually even more dangerous because it's making us more able to simply live our everyday life without altering it. If on the contrary we do as you mentioned, you actually treat it as they would call a ritual, where you actively develop different sides of yourself, then you actually, when you return to your everyday life, you're slightly altered, and it's that change that really matters. REHMSlightly altered, but then if you wish to truly be altered, you must keep practicing that. GROSS-LOHExactly. It's, you know, how -- we sort of encourage this idea of self-acceptance. This is the opposite. This is self-cultivation. And it's a very empowering message, that instead of accepting who you are and being at peace with that and learning -- I mean, that's actually a very sort of passive way of being in the world, and this is much more about cultivating yourself in ways in big and especially small because those are what over time lead to dramatic changes. REHMDid you actually talk with students who felt that they have been dramatically changed? GROSS-LOHYes, and the thing that I found most intriguing was that the changes looked very small. If we were to be asked, okay, give me an example of a student whose life changed as a result of this course, it's not about the big, dramatic change, but it's about sort of living your life in a very different way, knowing that the small things you do to cultivate the circles around you create larger and larger circles that result in transformation of yourself and your life, your world. REHMAnd you're listening to "The Diane Rehm Show." And a caller in South Bend, Indiana, hi Rob. ROBHi, thanks so much for this great program. I'm a 27-year-old graduate student, actually in ancient Christianity, and I've noted a lot of parallels between what the guests have been saying and what I study. So thanks for that. But I wanted to ask about bigger-type changes and bigger-type rituals. I mean specifically something like marriage. I note a lot of people in my generation are quite anxious about long-term commitments. They think, well, I don't know who I'm going to be in 10 years, why should I settle down with this person. A lot of us come from divorced families, as well. ROBAnd I wonder, is there anything in these texts, and has this come up in class, in terms of thinking of marriage itself as a ritual of lifetime transformation and the place of rituals within marriage. So what kind of -- how do these texts speak to longer, bigger changes, not just minute changes in the self? Thanks. REHMNow I'm going to take your line and say what a great question. PUETTIndeed. Truly it is. Thank you so much, Rob. PUETTAnd you're right, a lot of us think, well, I shouldn't, for example, get married because that ties me to a single person, and if I'm ever-changing, that's a dangerous thing to do. Now of course a lot of these thinkers would say, well, but think of the opposite, too. You're not wedding yourself to a person who's stable, you actually would be committing yourself to a lifelong work of working with another equally messy person. PUETTIt's a relationship, and that's the key. They say think of our lives as sort of relationships all the way down. A lot of who we are is based upon these relationships, and what you're committing yourself to is working on a relationship and all of the difficulties and complexities, but it's out of that relationship that we and those around us can become better human beings. REHMWe grow in that relationship. REHMBut the idea may be I like the way I live, I like who I am, I don't want to change, I don't want to have to deal with somebody else's problems, I have enough of my own. I can totally understand and appreciate this young man's point. PUETTAbsolutely, but of course that's always something we fall into, and it's dangerous. We can become very happy, but I'll use a stronger word, even complacent, with the way we're living our lives and forcing yourself not to live in such a world of complacency can be very powerful. In this specific example, forcing yourself to commit to the complexities of relationships can be a wonderful way to grow even if, by definition, it's going to lead to lots of difficulties along the way. REHMLots of difficulties along the way but so many rewards. I think you have written a fascinating book and one that's going to challenge a lot of people in their thinking. There's one last question here, which would take hours to respond to, but let me put it to you and ask you briefly. It's from Teresa, and she says, what about the concept of evil? PUETTYes, thank you, Teresa, fantastic question, and they would say maybe evil isn't a thing. Maybe think of evil as relationships that we fall into. And it's not evil in the strong sense that we use the term, it's kind of the difficulties and dangers of everyday life that we will be a part of creating by just our way of being, that we create horrible worlds in which people are not flourishing, which also means we can change those worlds and create worlds where they can. REHMMichael Puett and Christine Gross-Loh. The book is titled "The Path: What Chinese Philosophers Can Teach Us About The Good Life." Thank you both.